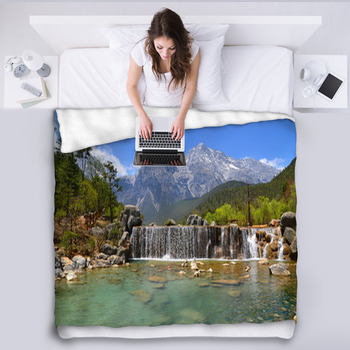 Our mountain themed blankets allow you to enjoy spectacular mountain vistas from popular destinations around the world just by looking at the fleece blanket on your bed or couch. Mountains are a source of fresh air, a symbol for great aspirations, and a reminder of our own fragility. 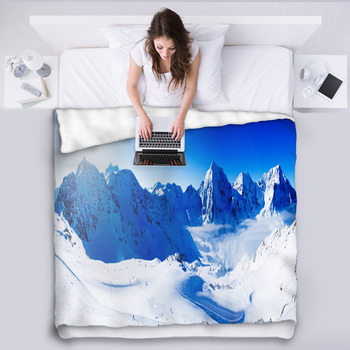 With customized mountain blankets, your home decor will be invigorated with the purity and enormity of these colossal structures. 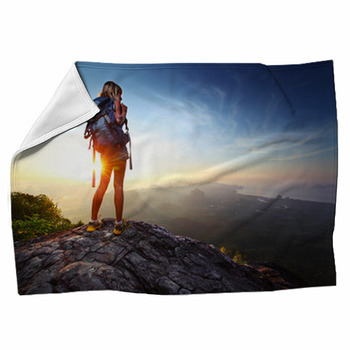 Show your children how incredible the mountains of planet Earth are by giving them bed blankets that exhibit panoramic photos of mountains from the western US, the Himalayas of Nepal, the Peruvian Andes and more. 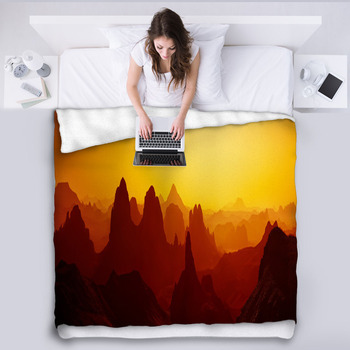 Your little kids or teenagers will be stunned by the unique sight of the snow covered Rocky Mountains framed by a giant reddish brown arch in the foreground of their personalized blanket. 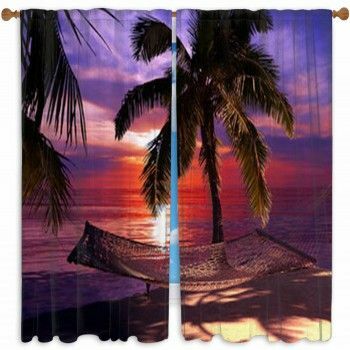 For a girl, choose a custom blanket that shows a valley filled with red, gold, yellow, green and brown trees in autumn. 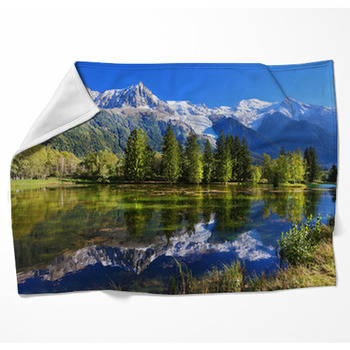 These blankets also display snow covered white mountains rising beyond the trees. For a boy, select the tallest mountain in the world, legendary Mt. Everest, shown on his throw blanket as the afternoon sun shines on its jagged white and brown peaks? 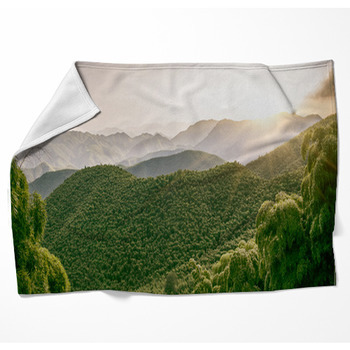 Then bring the freshness and beauty of mountains into your living room with couch blankets that depict a breathtaking landscape. 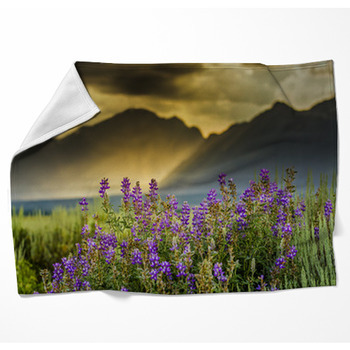 How about adding some wildlife to your mountain blanket? 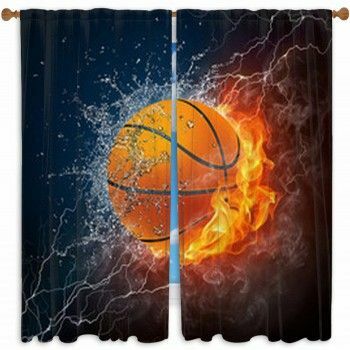 We have blanket throws that picture wild horses grazing in a dry field of tan grass, with a green tree line behind them, and steep mountains suddenly tearing up into the blue sky. 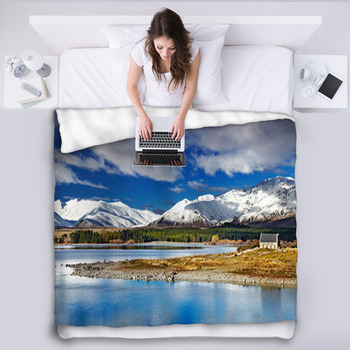 Other of our mountain blankets feature photos of mountain streams or lakes, old log cabins built on mountain meadows, a full moon rising over dark mountains, and a variety of mesmerizing mountain sunsets. 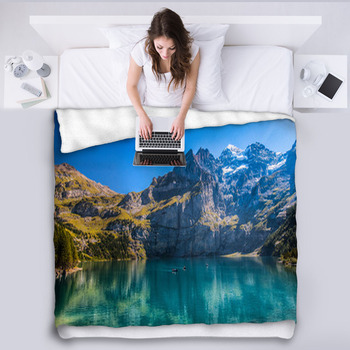 Immerse yourself in a room with a mountain theme by adding these mountain blankets alongside our mountain window curtains, mountain bedding and mountain rugs.